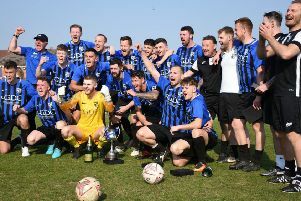 Selston are the champions of the Central Midlands League Black Dragon Badges South Division. An outstanding season came to a climax on Wednesday night as they racked up their 24th win of the season by beating Keyworth United 3-2. However, they didn’t have it all their own way as Markell Bailey gave Keyworth a 10th minute lead and, after being reduced to 10 men, Ian Marley doubled it on 38 to send the home side in two up. The boot was on the other foot after the interval as Shaun Farnsworth pulled one back within two minutes and Dominic Airey levelled things four minutes later. The all-important winner arrived 15 minutes from time as Carl Moore converted a penalty. Bulwell took a 12th minute lead in their home game with Matlock Town Reserves, the goal coming, almost inevitably, from leading scorer Jake Fisher, who lobbed the keeper. Matlock struck back in the second half, Max Hunt equalising on the hour, Matt Wilkinson slotting home from 20 yards to clinch the points for the visitors. Swanwick Pentrich Road pulled in one of their extensive backlog of home matches, but to no avail, as they went down 2-0 to Hucknall Town, which put the visitors temporarily back into second place in the table. Montell Gatland scored Hucknall’s opener, Niall Thompson getting the second. Belper United overtook them 24 hours later, despite going behind to visitors Clay Cross Town. Ant Lynam put the Millers in front after 26 minutes but Ben Stockley equalised five minutes before half-time. Micky Dunne gave Belper the lead on 49 minutes, with a late own goal ensuring the points. There was a Cup final rehearsal at Blidworth where an Eden Homer goal proved decisive against Hucknall Rolls. Ollerton Town took an important step towards a possible promotion from the Black Dragon Badges North Division with a 1–0 win over an impressive Brodsworth Welfare at Walesby Lane. The match was keenly fought for the full 90 minutes, the decisive goal coming from Kyle Ludlow in the 49th minute. The win moves Ollerton into third place, level on points with Harworth Colliery but with a game in hand, setting the stage for an important showdown between the two sides on Saturday. Retford had an emphatic 4-0 victory over an inconsistent Askern side, Will Tomlinson’s brace including a penalty, Paul Middleton and Jack Johnson also scoring. In the YourFootballWorld.com Reserve division, Teversal played their first game for five weeks, returning to action with a 2-1 defeat of Sherwood Colliery. Scorers for Tevie were Bradley Cox and Dean Short, Mickey Taylor replying for the Wood. A last minute Chris Heathcote goal gave Pinxton the points at Mickleover RBL as they squeezed home 3-2. Jamie Carter and David Moon got the goals for the Legion, Louis Roberts and Matty Robson scoring the others for Pinxton.